Looking Back At A CHRISTMAS CAROL (1984 George C Scott Version) | Warped Factor - Words in the Key of Geek. To say ‘there’s no bad version of A Christmas Carol’ is to live unaware of bastardisations like the modern musical version starring Kelsey Grammer, or A Carol Christmas, starring Gary Coleman from Diff’rent Strokes as the Ghost of Christmas Past. But it’s worth keeping in mind how hard you have to work to make the story of A Christmas Carol fail. That said, the George C Scott version is one of maybe five main contenders for ‘best film version.’ There are purists who claim nothing but the Alistair Sim version will do. There are geeks who hold fast to the Trek-friendly Patrick Stewart version. There are, presumably, video-game fans who think the animated Jim Carrey version is the best telling of the tale. There are puppet-fans who will tell you the Muppet Christmas Carol is the most sincere and effective rendering of the story. And then there are those who claim Scott’s is the ultimate Scrooge. There seems no-one at the moment who will argue for Albert Finney’s musical version to take the Golden Miser as the best interpretation of Dickens’ penny-pinching money-lender. 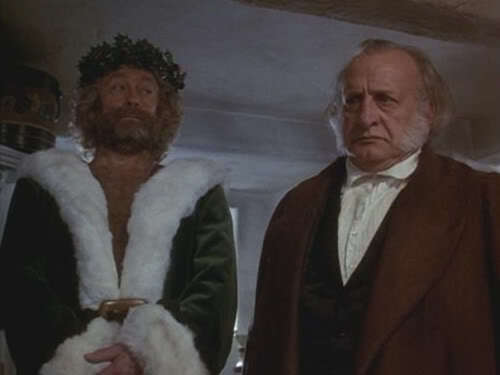 The George C Scott version, perhaps more than most, tries to give us an insight into why Scrooge is the way he is – it gives a strong emphasis to the fact that he never felt loved as a boy, bringing the character of his father into the story and showing him as a cold, embittered man himself, drawing on the line in the original story that claims Scrooge’s mother died in giving birth to him and extrapolating the coldness between father and son as a kind of inability to forgive the child for robbing the world of his mother. We get the sense that the father, played by veteran British actor Nigel Davenport, views the young Ebenezer this way, as a thief of his joy from his very first breath, in a foreshadow of how Ebenezer will come to think of his nephew, Fred. To be fair, this is a reasonably Dickensian idea, though it seems to take the line that Scrooge’s father never loved him and then graft the backstory from Dombey and Son across. To be additionally fair, it does it with a light touch that is readily acceptable to the audience. The whole story of Scrooge in A Christmas Carol is that of a man first seen as static, immoveable, unchangeable in his miserly ways and his radiation of coldness and a hard heart to all the world, but then, seen at various other points in his life, to be understood as a child unloved, a clerk happy, a lover optimistic, and then, from the death of Fan through his growing acquisitiveness and his loss of his own chance to have a loving wife and family, to see a man who builds his own cold prison around him, day by day, brick by brick, choice by choice. The idea that Christmas can destroy all that coldness, that a glad-hearted acceptance of the spirit of Christmas can redeem him from the prison of his wretchedness and the ‘sin’ of his indifference to the humanity around him is, whichever way you slice it, the underlying metaphor of A Christmas Carol, the spirit of Christmas being analogous to the child whose birth is erroneously celebrated at midwinter, bringing the promise of a salvation from sin and death to all the world. If you’re going to see Scrooge as the avatar of humanity being saved by Christmas, understanding his story is crucial – he doesn’t work as an avatar of anything if we don’t come to understand him. So the film’s extrapolations on his father’s coldness are fine. Where they’re perhaps less successful is in the explicit statements woven in about why young Ebenezer embarks on his quest to accumulate money. 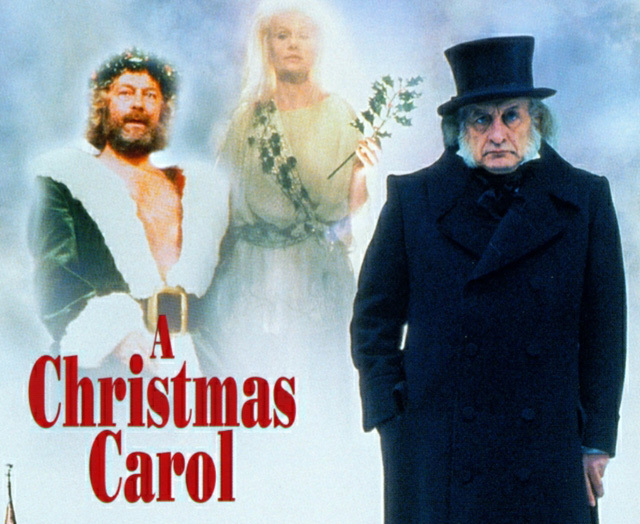 While it’s always been assumed by 21st century audiences that Scrooge begins down his path as a way of securing his future with Belle, but somehow, hearing him declare as much in this version feels like an oversimplification of the Victorian world, and doesn’t allow the death of Fan its place in turning Ebenezer Scrooge to stone. But let’s talk performances – in any version of any frequently re-delivered material, the performances, as much as the artistic decisions made, will be what renders it a success or failure. 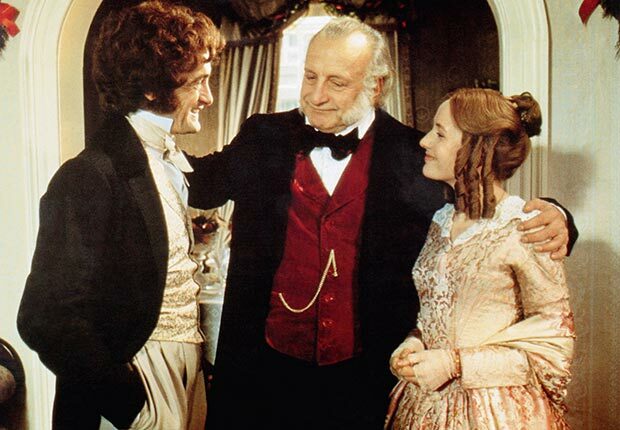 There are some great performances in the George C Scott version of A Christmas Carol, as you’d expect when you assemble a cast such as this one – David ‘Makes Everything Better’ Warner makes for a humble, mild-mannered but nevertheless reasonably shambolic and jolly Bob Cratchitt, and is well-anchored in his double-act of Christmas cheer by Roger Rees, later known for roles in The West Wing and Warehouse 13. Susannah York, too, matches Warner’s tone of struggling benevolence as Mrs Cratchitt, though she’s not afraid to bring some fury to the role when it’s absolutely needed. As Young Ebenezer, Mark Strickson delivers a Turloughish turn, the combination of awkwardness and passion that he’d given the alien coming through in the young clerk too, making him a man always at risk, always on the edge of melancholy and overseriousness, but able to be saved by enough good company and better angels. 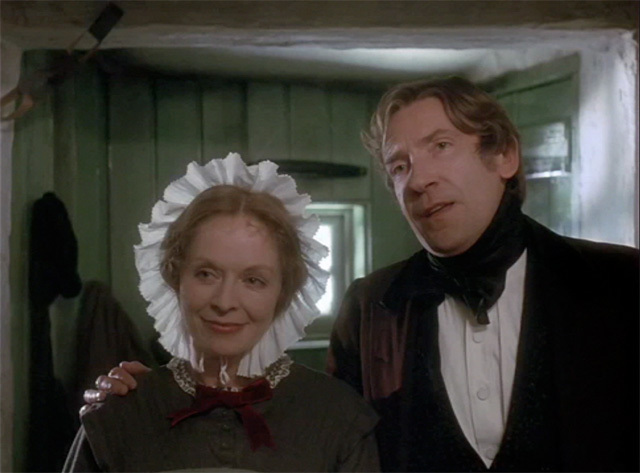 Joanne Whalley’s Belle is a simpler ask, inasmuch as she’s the chief among his good angels, and Whalley, without changing the words of the original at all, brings a surprising modernity to Belle’s understanding that she’s been replaced in Ebenezer’s affections. The supernatural players are an odd mix – Frank Finlay, while a great actor in many respects, feels rather more like comedy relief than perhaps he should do as Jacob Marley, and if you were asked to pick Eighties actors to play the giant spirit of Christmas Present, it’s not clear that your mind would immediately turn to Edward ‘The Equaliser’ Woodward, but to give him his due, he makes an unnerving fist of it, the combination of jollity and accusation making for an effective lesson. Angela Pleasance as the spirit of Christmas Past has a more level-headed road to run, more like a schoolmistress not entirely pleased with her pupil’s progress, and in herself, she’s effective too. If the Scott version of A Christmas Carol has a particular failing, it’s in the version of Scrooge written for and enlivened by Scott himself. There are perhaps a handful of areas where, despite being an eminently watchable version of the Victorian Miser-General, Scott’s Scrooge misses the mark. In the first place, it’s almost distractingly noticeable that this Scrooge is rather well-fed and robust for a man who, both in the book and in this movie, is seen to subsist on thin porridge and cheap soup. More than that though, this is a Scrooge who does not seem to have sufficiently shut out the world and its jollity – he makes his own mordant jokes, and laughs at them, to the astonishment of listeners. It’s true, Scrooge does have a way with witty words in the original, and the whole riff about the workhouses being empty does actually beg for a darkly comical interpretation. But Scott plays it not as a joke for one, a cruelty wrapped up in the trappings of humour, but as though his Scrooge expects the charitable gentlemen to whom he says it to explode with mirth of their own and quit their begging, their lives changed forever. In essence, before his supernatural visitors, it’s played as Scrooge actively waging his own ‘war on Christmas,’ trying to change the minds of others to his ‘right’ way of thinking. 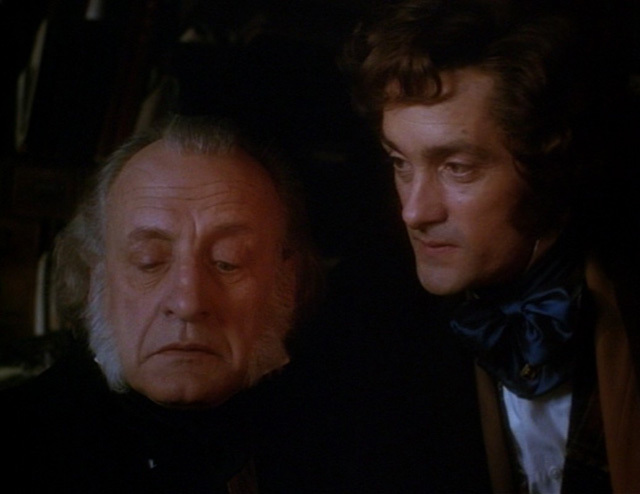 While that’s a perfectly psychologically valid way to go, it ends up making us dismantle the very idea of Scrooge as unreachable and unchangeable – if he has enough to do with the world as to actively laugh, to actively try and change minds, then his journey of redemption is not so great, and the power of A Christmas Carol is diminished as a result. And so we go on to find it – he is too reasonable, too balanced throughout the first two spiritual visitations for the third, and the change it provokes in him, to have the real power that it should have, meaning that while it’s still a great, Christmassy way to spend a couple of hours, the George C Scott Christmas Carol misses out on the top spot, even to the Muppet version, where Michael Caine plays it absolutely straight, and so allows the life-change he undergoes to be the joyous thing we the audience need it to be, transformative both to Scrooge and to everyone he knows, and the salvation of a lost sheep. Scott’s version of Scrooge, while always enjoyable, goes through his movie seemingly just waiting to throw off the cloak of misery and be the happy version. That means we don’t feel the transformative power of his realisation anywhere near as much as we should. Who’s your Top Scrooge? Let us know in the comments.